The audience member watching"The End of TV," as staged by Manual Cinema, has their choice of what to watch on stage, and why. The show will run at Emerson Paramount Center in Boston through Jan. 27, 2019. Advertisements are deeply engrained in every aspect of our lives, especially commercials. We grow up watching commercials, so much as memorizing the jingle or punch line of popular ones. “The End of TV” by Manual Cinema did a beautiful job at analyzing the effects of commercials on two vastly different lives through a use of silhouettes, puppets, and real, live actors. 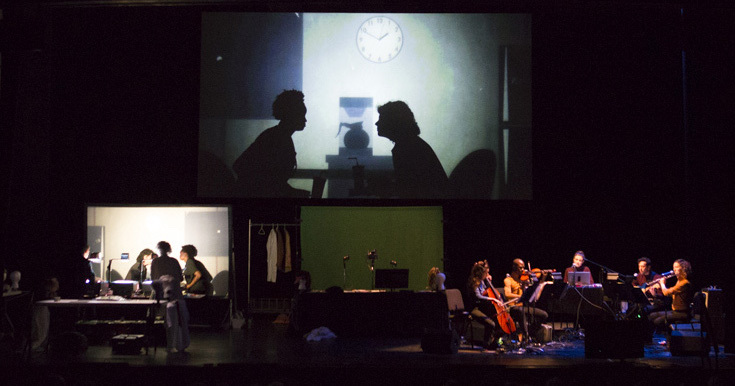 “The End of TV” is a play set during the post-industrial 1990s. This follows the lives of an elderly woman struggling with dementia, and a young African-American woman as she is laid off of work. The beginning of the story is a bit difficult to interpret, but as it progresses you watch these two contrasting lives merge into one storyline. As the elderly woman experiences dementia-related episodes, the audience is bombarded with loud noises and transported to a collage of commercials and advertising, one of the most apparent being the Green Giant from many canned vegetables. We witness this woman struggle to balance the difference between her reality and commercials. Eventually the younger woman joins a food delivery service, and finds the elderly woman in the midst of an episode. The story then follows the connection that is formed as the young woman explores the elderly woman’s life and her family. It is a beautiful story told in an incredibly artistic manner. You could watch the main screen that displayed the puppets and actors as silhouettes, or look on the stage and watch the actors and actresses as they change in and out of costumes and exchange props. On the side of the stage is a band of various instruments and vocalists. The music was one of the best parts of the performance, each song enhancing the story told through silhouettes. Each song was unique and emotional. “The End of TV” is an extremely artistic and unique play, one that isn’t similar to anything I have ever witnessed. If you haven’t bought your tickets yet for the show, I would strongly suggest getting them, as there is something new for everyone to see.